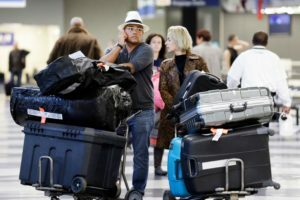 The State Aviation Service of Ukraine has posted on its website the new rules of air transportation of passengers and baggage that have come into force. The document, in particular, does not contain the norm on the mandatory free baggage allowance of a certain weight (previously 15 kg). According to the new edition of the rules, information on the maximum amount and weight of baggage, accepted by the air carrier for transportation without payment, is specified in the rules of the air carrier and the contract of carriage provided to the passenger. The State Aviation Service also legalized the new rules for charging fee for registration at the airport. “Check-in at the airport is free of charge if it is provided for by the rules for applying the fare according to which the ticket was purchased and also if registration cannot be done via the airline’s website or using the self-service kiosk. Otherwise, the air carrier may charge an additional fee for check-in at the airport,” according to the rules. The deadlines for check-in and boarding have also changed: now airlines can close check-in counters no earlier than 45 minutes before departure, and boarding gates no earlier than 15 minutes before departure (earlier 40 and 10 minutes respectively).